Sigma Beauty Affiliate Program: UPDATED BANNERS! Celebrating Worldwide Beauty! 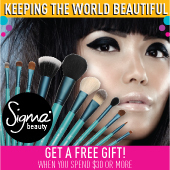 Sigma Beauty has always been an internationally recognized brand. We have proudly shipped our products to over 100 countries, and we are so happy to have had the opportunity to reach so many diverse cultures. Our motto has always been, “Keeping the World Beautiful”, and to represent our global following, we have created these new affiliate banners! Just copy your favorite banner below, paste it on your blog, and add your affiliate link! We hope Sigma has brought beauty to you, both inside and out! Let us know how beauty is expressed and celebrated in your country! Uau!!! These baners are wanderful!! Very, very beautuful! Congratulations! A friend of mine wants to buy the brushes, but she don't have International Card, and I said that Sigma also works on deposit at the Bank of Brazil. Do you still have this option? If you have, How should I proceed? 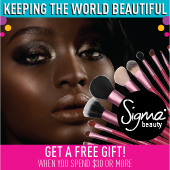 Should she sent my link (http://www.sigmabeauty.com/?Click=72683) via e-mail? @Roberta Ayumi We do still have the option of using the Bank of Brazil. If you are interested in using this payment method you can contact atendimento@sigmabeauty.com and Cristina will help you! I love them!!! They're all so beautiful!! And, they show my blog personality better!! I can sell the Sigma products in my virtual store? 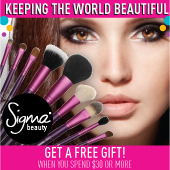 @MaraLima Please contact our wholesale department at wholesale@sigmabeauty.com for more information! I'm loving the banners! I'll work out how to put these on my website soon! @Anonymous Please contact affiliate@sigmabeauty.com for banners in different languages. Thank you! Uau! Vou colocar todos em minha lojinha!!! hi, I just sign up for sigma affiliate program. I need the banners in brazilian portuguese. what should I do? 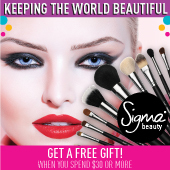 @Missmmonteiro Please contact affiliate@sigmabeauty.com for banners available in Portuguese.